Threshold vector traces of cool pics, cartoons and vintage postcards for your design projects. 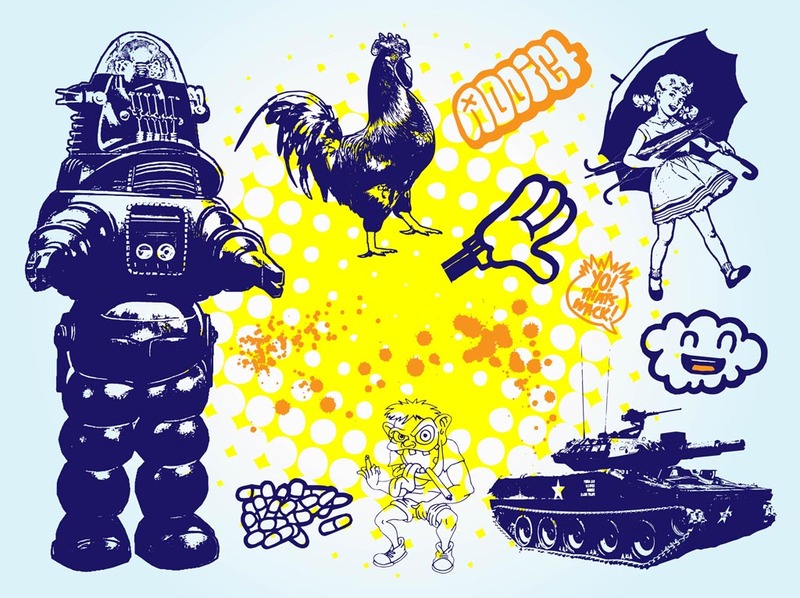 Download this original design set with B-movie space robot, paint splashes and splatters, cloud illustration, smoking gnome who gives the viewer the finger, rooster, Mickey Mouse cartoon hand, military tank, comic speech balloon and happy girl with open and closed umbrellas. Vector graphics are set on sky blue radiant backdrop with bright halftone pattern decoration. Tags: Cartoon, Cloud, Comic, Crazy, Drugs, Pills, Threshold, Wack.